Home > About Smooth-talker > How sales scripts benefit you. A business script will increase your appointments and thus increase your sales. Business scripts will increase your hit-rate for getting appointments by adding impact statements and power responses. Business scripts will enhance your lead generation efforts. After using a business script for a period of time, you’ll reach a point that you’ll be able to repeat the dialogue without needing to read from a script. A business script makes it easy for you to say the right things to a potential prospect. You will sound convincing. You must think on your feet and verbally outmanuver the prospect with power words and impact statements. You don't have time to look up a response buried in a book. It will make your sales conversation sound credible and make the prospect agree with you. You just flip to a heading and real aloud one of the "1-liners" of dialogue. It's just that simple! Just stand the business script up in front of you and dial the phone. Includes a 24 page Instruction Book and extra pages. 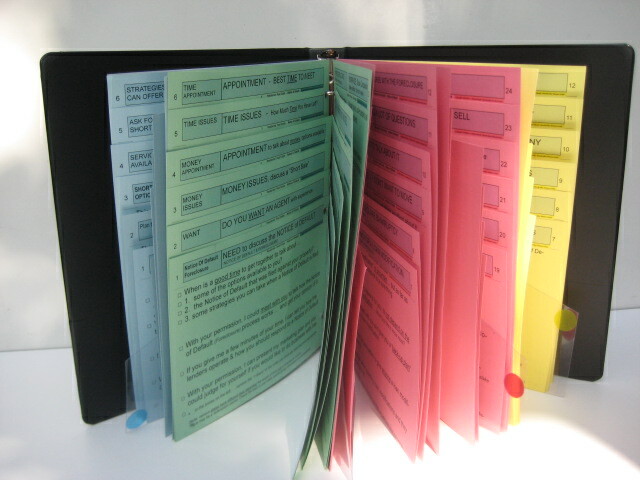 Shown is an upgrade to a genuine Leather Binder / Script holder. Smooth-talker Business Scripts come ready for immediate use. 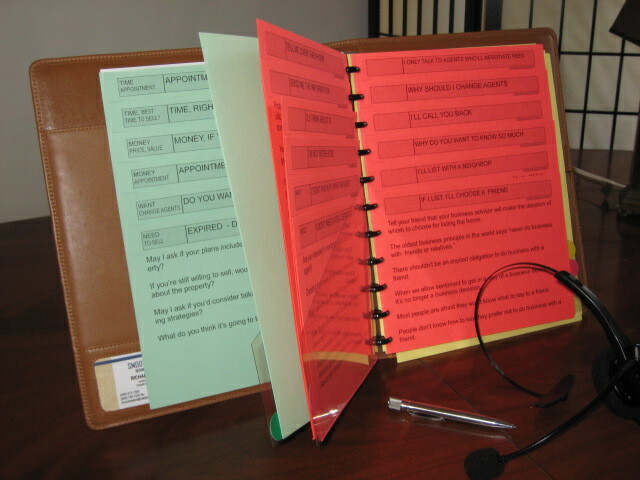 Business scripts is a tangible product that you can use immediately. It's not something you must assemble or make yourself. It's ready to use when you stand the business script up in front of you and dial the phone. You can be prepared with the right words that will get you more appointments. The dialogue becomes your stock answers to the prospects questions & objections. Smooth-talker business scripts are easy to use. The majority of salespeople have difficulty with too many choices. Business scripts limit the number of pages to 60. Even though we have over 5,000 "1-liners" in our files that we could pick from, if we were to write all of them, we would in effect, be writing a book. The original problem was too many things to say. It would be too much dialogue for the salesperson to use effectively in the real world of prospecting. With a business script for sales, you don't have to remember anything, you only have to be able to read. We usually remember what to say, but it's often too late. With Smooth-talker a business script there is no need for a perfect memory. Everyone wishes they could have said something different at one time or another that would change the outcome of their life. The trouble is we think of something better to say after it’s too late! No one has the memory power to remember the 700 to 3,000 words used to make a typical prospecting call. Having a business script for selling is like having the "other teams playbook." It's almost like reading someone else's mind. Salespeople have difficulty remembering the right words to say. In the real world of prospecting, the words you say seldom happen exactly in same sequence. That is why our business are designed with “random access” in mind. Repetition aids memory by using prospecting scripts. It's so simple that I'm surprised that it wasn't thought of before! When you approach a person by telephone, that is the point in time that you fear the most when the prospect speaks. You face the fear of rejection. Depending on what the prospect says, you have 3 options. Talking, determine if they want your product & service, have the money to purchase, give you an appointment etc. Stop & Listen, for an objection or a question ... and then you must respond to them. Selling yourself, your product & service and all the reasons the prospect should do business with you. The answer is to have a Smooth-talker business scripts. 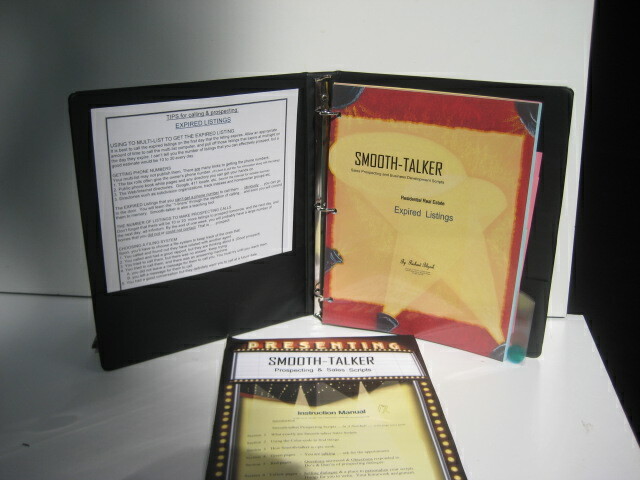 A Smooth-talker script for business is a tool that is desperately needed. If only there were something available that that will help people remember the right words, then salespeople will get over their fear of making a prospecting call. If you don’t have anything written down in front of you, then you’re only recourse to rely on memory. The script prepares you for most of the things you run into when making a prospecting call. The dialogue typically cover all of the elements of a prospecting call: Need, Want, Money, Time, Decisions, Potential, Closes, and The Next Step etc. You can respond with direct information or you use words that side steps the issue entirely. If you give direct information objection response, often you may get bogged down with the subject matter instead of continueing towards you goal of getting an appointment. We couldn't hope to write complete business script for selling for each & every business, ...we write just enough to get the point accross. We're all in the words business. The words we use give validity to our ideas. Words convey the messages, thoughts, ideas that you want to discuss. They deliver the viewpoints, concepts, and attitudes. In any business sales profession, it is advantageous to create a unique identity, to be recognized, to stand out and be different. Be prepared in advance of that crucial moment in time that you need to respond to a question with carefully worded dialogue. Prospects are predictable when it comes to the things we expect them to say. In the real world of business development, you will get questions and or objections. Not surprisingly, prospects have been saying the same things forever. In the normal course of a prospecting call, a prospect will have about 25 usual objections. It would be impossible to write a sales script for every conceivable situation nor should you even try. Preparing to write a script for business for the "most often occurring" questions or objections will be sufficient. Saying the wrong thing will cost you sales. A salesperson will say what comes to mind when you just don't have time to adequately think of the best things to say. If you rely on what comes to mind, you're liable to say something counterproductive. Listening while talking is avoided by using a business development script. When making a prospecting call, it’s counterproductive to try to concentrate on listening to the other person while thinking of what you’re going to say next. Use a sales script to be on the safe side. Insisting on using a script for business development insures that a salesperson abides by the Department of Licensing rules and Fair Business Standards. Writing an approved prospecting and sales script insures that you comply with Department Of Licensing rules and regulations. Writing a script word-for-word satisfies the requirement that you to say something according to the law. Mandatory phrasing of a prospecting script means that some things will be said in a legal way. For instance: real estate commissions are negotiable and tax advice and legal advice are prohibited. Also it avoids getting you into trouble. SalesBusiness scripts insures that courtesy will always be used. Courteous dialogue can be demanded from salespeople and they are expected not to deviate. Business script dialogue then becomes the standard by which all other sales conversations can be measured. Using a business generation script the dialogue eliminates from a person from using their own brand of business dialogue. Also, a sales script promotes consistency and prevents them from using their own “homespun” words. The underlying problem is "fear of rejection." Fear is the real reason that salespeople hate to prospect. It's a well known fact that everyone hates prospecting by telephone, though no one knows exactly why, much less what to do about it. Fear of rejection is at the core and it is hard to overcome such a basic element of the human condition. Even though every salesperson won't admit it, they un-consiously fear approaching new people .. especially by the telephone. Why do salespeople have fear and how do you overcome fear? By isolating that which evokes the reaction, the prospecting call will become friendlier and easier to make. Acknowledge the fear and examine it, and then it can be handled. You won't let a gruff voice or a bad attitude of a prospect keep you from your goal of becoming successful in generating new business. Negative psychological thoughts that were implanted at an early age are constantly holding back the salesperson. It shouldn’t be taken lightly but it can be changed once we acknowledge it. When salespeople make a business call, they dislike controversy and hostility. Sales managers claim that salespeople want everything to go just right. They don't like controversy because they feel it's like walking through minefield. Salespeople give up too easily. If you don't make the call, someone else will and you won't get the chance to help the prospect. Salespeople avoid controversy by giving up prematurely. Hostility from a prospect is reason enough to end the call and move on. Flight from fright takes its toll once again. A hostile prospect has a lot of issues that can't be solved by a salesperson but it's hard not to take it personally. What’s the big deal about fear of rejection anyway? We get it all of our life. Business scripts help you cope with the stress of prospecting. Sales managers tell us that salespeople say it's easy to blame the company for not having enough new business leads. It is more accurate to blame your emotional state on your ability to control fear. "Who wants to walk into a meat grinder anyway?" By using a script for business, a salesperson will anticipate stressful situations when making sales calls. After a certain number of stressful calls are made, the salesperson is in no mood to take on another traumatic situation. The dislike is so powerful that many salespeople find a way to avoid making calls to seemingly hostile prospects.